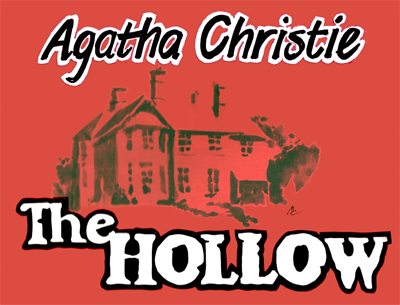 The Hollow is a 1951 play by the famed crime writer Agatha Christie, based on her 1946 book of the same name. The action takes place in the garden room of Sir Henry Angkatell’s estate, The Hollow, about eighteen miles from London. His wife Lucy has invited several people for a weekend, but when John Cristow turns up murdered, Inspector Colquhoun and Detective Sergeant Penny are called in to solve the crime. As usual, Christie throws plenty of twists and turns in the way before the murderer’s identity and motive are revealed. The cast of Agatha Christie's THE HOLLOW. Sir Henry Angkatell and his wife Lucy get more than they bargained for when guests visit their estate, The Hollow. Midge is in love with Edward. Sergeant Penny and Inspector Colquhoun investigate a murder at The Hollow. John shares a moment with Henrietta. Doris receives instruction from Gudgeon, The Hollow's all-knowing butler. Midge and Edward find themselves with a serious problem. Gudgeon delivers a troubling note to John. Veronica tries to convince John to see things her way. John with his adoring wife Gerda. Inspector Colquhoun and Detective Sergeant Penny question Veronica about the murder at the Hollow. John and Henrietta are caught in a web of deception. Henrietta and Gerda share a moment of confidence.